I recently visited my parents in Florida and no trip is complete without a visit to The Columbia. Originally opened in 1905 by Cuban immigrants in Ybor City, it is the states oldest restaurant. The family has since opened a location about an hour south in Sarasota (where my parents live) – a stunning restaurant with incredible mojitos, the best black beans and rice I’ve ever had, and of course…an amazing Cuban sandwich! The cornerstone of an authentic Cuban sandwich is the delicious slow roasted pork. If you happen to have some Cuban roast pork available, by all means use it! I’m still recovering from endless hours of cooking over Thanksgiving and trying to psych myself up for the Christmas insanity – I’m sorry, I just didn’t have it in me to roast pork. So I visited the deli counter at the grocery store and asked for maple glazed ham to add a bit of sweetness and hot capicola for some spice. Purists may shake their head and call this a Cuban ‘inspired’ sandwich, but honestly even without the roast pork, it still made a good sandwich. Damn good. Good bread is essential, and ideally you’ll want to use Cuban bread (a white bread similar to Italian or French bread, though it’s generally baked with a bit of fat). I was surprised to find that my local grocery store carried Cuban bread, but you may substitute it with a long loaf of Italian bread if need be. If you are substituting the Cuban bread, I would suggest that you not use something too crusty, like a baguette. The exterior of the bread needs to have a bit of softness so that it can be later pressed. 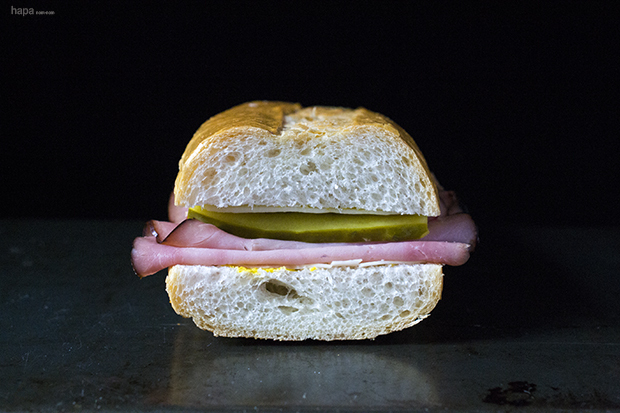 I’ve made this sandwich with a variety of pickle types, and I have found that dill pickles are by far the best compliment to the other flavors. I once made a Cuban with bread and butter pickles and the flavor combination was totally off – I actually had to remove the pickles from the sandwich! Dill is definitely the way to go! 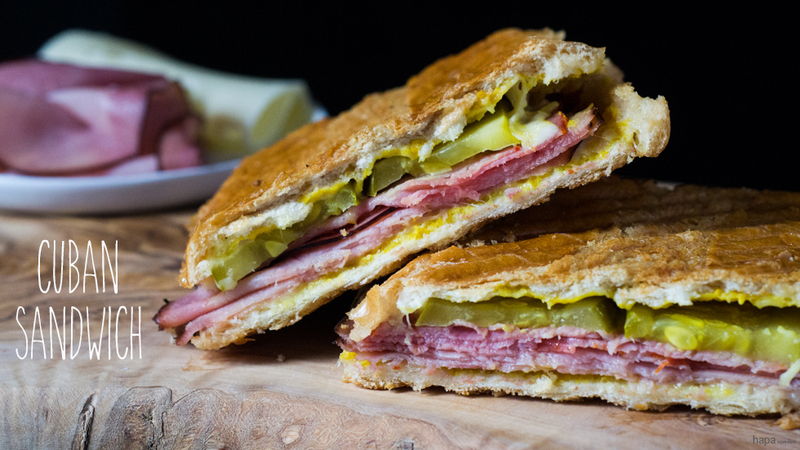 A good Cuban doesn’t have a lot of fussy ingredients, but it’s packed with a ton of flavor! 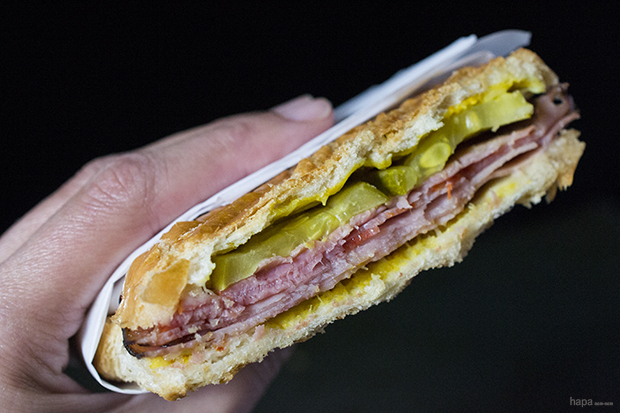 A traditional Cuban sandwich is layered with ham, roast pork, swiss cheese, pickles, and mustard – there’s no lettuce, tomato, or mayo on this baby. As with any dish, the better the ingredients, the better the sandwich – this becomes even more imperative with fewer ingredients. The sandwich should not be overstuffed with ham, but well proportioned. Pressing the sandwich reduces it’s size by about half while crisping the bread, melting the cheese, and rendering the flavors of the ingredients. (You don’t need a panini press to make this sandwich. Instructions for an alternative press are in the recipe directions). 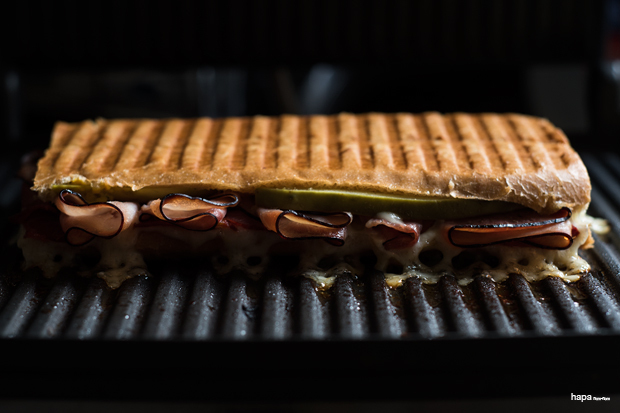 If you are using a panini press, preheat to medium-high. (If do not have a press, you can use a sauté pan). Slice the loaf of bread into 4 equal pieces and then each piece lengthwise. Spread the butter on the outside of each half and then spread the mustard on the inside of each half. Cover the inside of each half with swiss cheese. On one half of each sandwich, layer 4 slices of maple glazed honey ham and 4 slices of capicola. Place 2 -3 pickle planks on top of the ham and then close the sandwich. Place the sandwich in the panini press and place something heavy and heat proof, on top of the press (I use a sack of flour, but several cans of veggies will work too). Cook until the cheese is melted and the outside is crispy, about 5 minutes. If you are using a sauté pan, heat over medium-high heat. Transfer the sandwich to the pan and then place a flat-bottomed dish like a baking dish or smaller pot on top weighted with something heavy, like a sack of flour or canned food. Cook 2- 3 minutes per side. Transfer the sandwich to a cutting board and slice in half. Serve and enjoy! Hi Emelia! I’m so glad you enjoyed these Cubans. I love them cold too! In fact, it’s lunch-time here… I think I’ll go make a couple 😉 Hope you’re having a great week! This was delicious and easy!! We used the deli meat and cuban bread that you suggested (we bought from our local grocery store) and then pre-made the sandwiches and took them to the beach (Siesta Key!) for a fun and tasty sunset dinner. one of the best one i ever had was in hollywood, fl. it was at the airport, buy i wish i can find something that good here. I just watched the movie “Chef”. Have you seen it?? Foodie must watch!! Anyway, the “chef” in it has a food truck with cuban sandwiches. I remembered you posted one so came to check it out again. He makes his own pork! Have you ever tried that? I bet the capicola from the stores here are nothing like what you buy! I just saw it too! Seriously, I think we must be riding the same wavelength! ‘Chef’ is such a great movie! I had plans to make my own pork for the sandwiches, but just didn’t have it in me after the holidays. But it’s something I definitely want to do! Those sandwiches in the movie had me drooling!!!! I live near Boston, MA. My local grocery stores all carry roast pork in their deli departments. I’ve found it works well in Cubano Sandwiches. I’d love to be a purist, but really……. PS – Love your blog! Thank you Nagi for introducing us! Hi Heather! Thanks so much for stopping by! Nagi is truly wonderful, isn’t she? I live in Minnesota now. Their “authentic” Cuban sandwiches are made with something resembling a hamburger bun. Aargh! 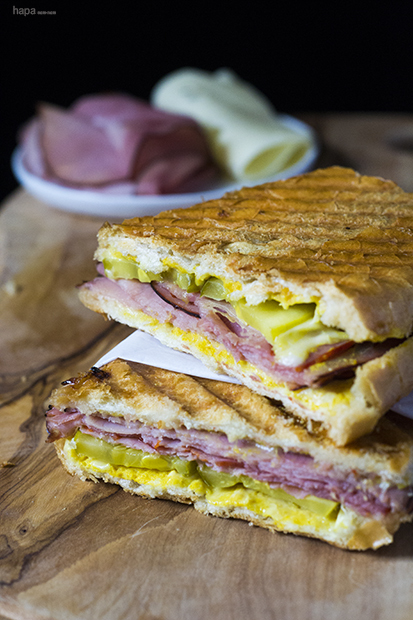 I’ve been wanting to make a Cuban sandwich ever since we saw the movie Chef…yours looks perfect! Now this is a seriously good looking sandwich! Totally craving one to devour right now… I love anything smothered in mustard, pickles and cheese! This is a cuban sandwich?? I didn’t know! And OMG I can get all these here in Aus!! Well, except Cuban loaf. I will have to make do. You know what lunch is going to be today….?? That’s great! Don’t worry about the bread! I’ve used a loaf of Italian bread, and it’s still yummy! Thanks, Mira! I love homemade sandwiches too! What a great sandwich, my husband would love it. Thanks! My hubby loves them too! Oh man! I could go for this damn good sandwich right now! Everything in it makes me happy! Very nice post! The next time I’m in Florida, I want to make my way to The Columbia! Thanks, Annie! A trip to The Columbia is definitely a joy while in Florida!